This is why I chose to make this list, because of an article that I recently read about a new type of soccer ball that has been developed out of hard foam for use in underdeveloped nations and how it was being toted as a “lifesaver”. I love soccer and do believe in it’s value in building community, but let’s not get dramatic over the potential of a single style of soccer ball to save the world. I devote a good amount of my time in Haiti to soccer and surrounding myself with people who like to talk about soccer and how to make it better in our community. And not once has anyone said, “Man, if we just had a different ball, I don’t think children would ever cry in our community again.” The article that I read by Tate Watkins on the issue also illuminated something that frustrates me which is the exploitation of celebrity status for the sake of good doing, which is something that I will discuss further at the end of this list. But the fact that this whole new soccer ball has been glorified much because of a chance encounter with Sting, makes my eyes roll even farther back in my head. The old soccer balls are not that expensive, and do not pop every day, so let’s just stick with them and focus our innovation elsewhere for now. 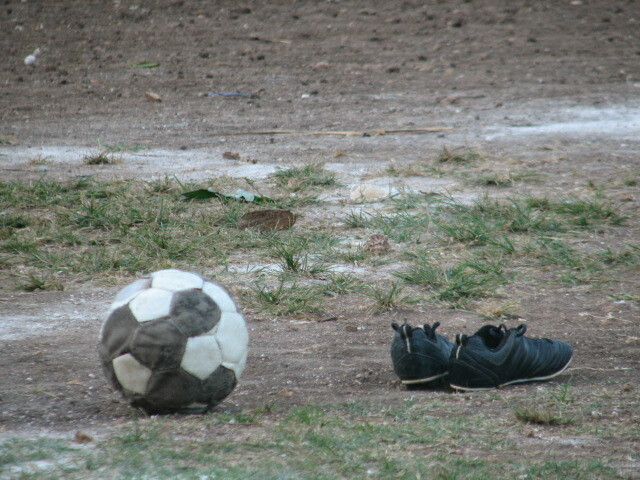 On the list of most immediate needs facing Haitian society, unsatisfactory soccer balls is at the bottom, if it makes the list at all. During my time living and working in Haiti, I’ve come across different charities promoting any number of different clean cook stoves for the people of Haiti to use as an alternative to charcoal cooking or the three stone open fires that so many use. There are solar ovens, there are rocket stoves, there are lots of different ideas to address this problem, and I always applaud innovative problem solving. But we have to put ourselves in the shoes of those people that we expect to receive and use these things. And they think something like this, “Why don’t you help us to get electricity in our home so that we can use a real stove instead? Why don’t you help us make some income so that we can purchase a real stove on our own? You know, like the one you use in your home, because you would never use one of these things unless you were camping, which is apparently a thing in your culture, camping.” I think these questions are reasonable. Why aren’t we thinking towards those sorts of results instead of trying to sell them the idea of some sad imposter of a stove, is that all that they deserve? I’ve said it before and I’ll say it again, there is no more vile substance on the face of the earth than Styrofoam. I have always believed it to be the most evil invention since cavemen began chiseling away at the wheel. Aside from my personal repulsion for the stuff, however, I still cannot understand the trend that is gaining popularity in the charity in Haiti world to build homes out of the same stuff that they put take out in to send home to your refrigerator. I do understand that from an engineering standpoint, the method of using what is called Nudura block, is a sound construction method, however, my distaste for this intervention in Haiti is for similar reasons as the cook stoves. Haitians never asked for new construction methods, and certainly not ones that cost more and take more time, as this method does. If you read my post on 6 Things Haitians Can Do you know how I feel about this subject. If we want to create better construction solutions for the people of Haiti, why do we think we need to invent completely new technologies when their existing methods just need some minor tweaking to produce the same results? We need to look at what’s available locally first and foremost and decide how we can encourage local innovation, local materials, and local skills. And whatever we decide to do, we should never ever do it with Styrofoam, no matter where we are in the world or what we’re trying to accomplish. Recently named by New York Magazine as one of the 50 Ugliest Shoes in History, they were described as looking like “a bandage stitched to an eraser”. If their ugliness wasn’t reason enough that they should never be given to anyone for any reason, they also have been given to people in poverty all over the globe under the guise of charity but have been proven to actually have a negative impact on local economies. With a “get one, give one” philosophy, for every pair that is bought by a hipster or a hippie in a developed country, they give one pair to a poor person in an underdeveloped country. But they don’t just give, they “dump”. I think I speak for most humans when I say that I don’t ever want anything to be dumped on me unless it’s cold, hard cash. It’s demeaning enough that you think I’m poor enough that I need your ugly charity shoes, but you emphasize that you view me as lower than you by dumping them upon me. Also, I’ve seen these shoes be distributed in Haiti and it was a frustrating process to watch because, as long as they get to a poor country, they don’t seem to care who gets them. Because as long as you’re in a poor country like Haiti, you must need some TOMS shoes. I even got offered a pair but they didn’t send any big enough for my feet. How do people still think these are a good idea? No surprise that the guys from 1Dollar Poverty are using them as their primary tool in their misguided awareness campaign. Ask Lance Armstrong, The people behind Kony 2012, and Evangelical Christians how well bracelets went for them. There’s still cancer, child soldiers in central Africa, and no one knows yet what Jesus would really do. And any progress that’s been made on any of these fronts can’t be accredited to the thousands and millions of bracelets that money has gone into producing. The progress can be accredited to science, effective national and political intervention for peace, and ordinary human beings deciding to live lives of love and justice. Don’t get me wrong, I sell bracelets when I’m promoting work being done in Haiti, but I sell locally made bracelets without any pretense of them turning the buyer into a superhero. I sell them because they look cool and the artists in Haiti that made them need to make some money. Awareness bracelets, on the other hand, are not answers for anything. Again, refer to #2. Why don’t they just deserve electricity? The more we try to provide them with things that can work without electricity, the more we are prolonging the urgency to actually get them electricity. Haiti doesn’t need more solar gadgets, it needs extensive investment in infrastructure that will provide the basic services such as energy to the whole country. I know this is not as easy. I know that it’s something that none of us can do on our own, but we can buy a solar flashlight, or solar phone charger, or solar shower, or solar oven to donate to a Haitian. But the most sustainable solution never is the easiest or the one that makes us, the donors, feel the best about ourselves. I actually think Bibles are great ideas to give to Haitians because most Haitians are Christian and would love a Bible in their own language but can never find one to buy locally. If you’re looking for a nice gift to give to a Haitian friend, a Creole Bible is a great idea. But it’s just that, a nice gift. It’s not a solution to any greater societal problem. Most of the people in Haiti already know more of the Bible by heart than you ever will, so it’s really not going to change the way that they live all that much. If you want to get theological, God will take care of the way they live, with or without your gift of a Bible, because that’s what he’s been doing for centuries of Haitian Christians without Bibles already. So, that’s why Bibles makes this list. It’s a nice gift, but it’s not going to save the country. And for that reason, you should probably not ever fill your suitcase with them if you’re packing to come to Haiti. Besides, the overweight chargers would be killer. In the next couple days I’m going to be posting a whole post specifically about this because there’s a new TV show that’s got me a little hot. But for the sake of this list, suffice it to say that I think coffee could play a great role in the economic growth of Haiti. Two hundred years ago Haiti was the #2 largest producer of coffee in the world. It’s the only place in the world where I’ll actually drink coffee. I hate it anywhere else, but it’s so good in Haiti that I can’t make it through the day without some. However, it’s still coffee. And the problems facing Haiti’s economy are going to take a lot more than some magic beans to be resolved. Stay tuned for more on this in the next couple days. Foreigners are always trying to introduce new wonderful crops to Haiti such as moringa (the miracle tree) and amaranth, but find very little success. Primarily because, as with most things, Haitians never asked for these new crops. And why would Haitians ever ask for new crops like this when they already have some of the greatest variety of fruits, vegetables, and grains that they grow, and have grown for generations in their soil? Trying to show them these new crops will never make up for us screwing over their rice production years ago. And everyone knows that these things we try to convince them to grow are known worldwide as poor people plants. If they were actually a good idea farmers in Iowa and Nebraska would be growing hundreds of acres of amaranth and moringa. So when the soil in Haiti can grow almost any crop known to man, why would we try to make them grown these poverty crops? Because our ideas are always better? Because our ideas are always better. They don’t need new crops, just like they don’t need different soccer balls, just like they don’t need new cooking technologies, just like they don’t need new construction methods. This is actually the one thing on the list that might potentially work. But I hate that it might actually work. I give Sean Penn a ton of credit for everything that he’s done in Haiti, and agree with a lot, not all, of his methods. If it wasn’t for his group, after all, the National Palace would still be in a huge depressing pile of rubble. What I hate is that it takes Sean Penn to exploit his celebrity to actually get this amount of work done in helping Haiti to recover. I hate that we live in a world where that is the only way to make any progress. It’s not that Penn is any more knowledgeable in development or economics or anything. On the contrary, there are plenty of people much more qualified and experienced in these areas who would love to have the connections and the resources that Penn has to work with, but can’t throw their names around like an Oscar winner to bring sustainable development to a country. But at the same time, Penn is not the only celebrity that’s claimed to want to help Haiti, he’s just the only one that’s actually followed through on his claims. There are plenty of other celebrities whose good intentions have gone terribly bad and their famous interventions have met with infamous failure (I’m looking at you, Wyclef). If nothing else, if it takes someone like Sean Penn to keep Haiti in the news, then I’m thankful. At least people pay attention then. I think what’s wrong with Christanity is that we do not pick up our Bibles. I don’t know how many times I heard ” The Haitians thought the earthquake happened because God was mad at them” or ” I think the Haitians did something wrong and that is why God sent a earthquake” Also, many Haitians think it is okay to mix Christianity and Voodoo together. (Please Lee, don’t get monotheistic on me…pick up your bible) Christian’s should not just listen to a pastor…or a neighbor…or their parents for interpretation of The Bible. They should actually picked up the Bible and read it for themselves. By doing so they would know that God loves them so very much ….and by no means the earthquake was not God’s punishment. Thanks Anne, you know I agree with you. I do think it’s important for people, Haitian or otherwise to have Bibles, especially in their own language so that they can discover who God is for themselves beyond what everyone else says. So, if someone really wants to invest in a mission to provide Bibles to the people of Haiti, I guess I just want to encourage them to think about ways to do it that run deeper than handing out the books. Like considering helping a local merchant start up a book selling business where they can sell Bibles in the local language at a reasonable cost. Or even if it’s making Bibles available for free, then at least to make them available through a local institution where the receiver will have the chance to get connected into a system that will encourage that relationship with others who will be able to discuss what’s inside. I am glad we agree. I think culture and The Bible are lost in almost every part of the world. I think we need to help God bring that back to Life…whether that is being an artist or someone that studies The Bible. It is going to take all of our talents to bring back true meaning to where we once came from. Please forgive me if you have addressed this already in your blogs, This is my first day reading your blog, “10 things that will save Haiti “Not Really”, Have you written about what an average person can do for the most impact? I am interested in helping and in a small way have for four months, I’ve seen and have met many people who are helping in their own way, and seem to love what they are doing. I am interested in knowing If trees are being replanted and if this actually works? Roger, thanks for your comment and questions. If you go back in my archives a few months you might find a few entries that you find helpful, especially check out 10 Things that Actually Work As far as tree planting goes, it is definitely something that is needed and can work well as long as it’s done by a local organization that plans to sustain a larger scale reforestation program and is connected to community wide education about the environment as well. It doesn’t work if it’s a foreigner or group just coming in and planting a bunch of trees while they’re there and then leaving because the local community members have to be the ones to care about it and keep it up. If you want more suggestions on this, feel free to email me at thegreenmangoblog@gmail.com. I don’t know what area of Haiti you are in, but I could give you suggestions of some good orgs in the Jacmel area that do effective reforestation programs that might be good resources for you as well.